One of the most prominent nuclear generating stations in the United States is changing owners after it ceases generating electricity. Comprehensive Decommissioning International, LLC (CDI), a joint venture company of SNC-Lavalin (TSX: SNC) and Holtec International, has agreed to enter into a Decommissioning General Contractor Agreement for another US nuclear decommissioning contract, expected to exceed CAD $1 billion. Entergy Corp. (NYSE: ETR) has agreed to sell the subsidiaries that own Indian Point Units 1, 2, and 3, located in Buchanan, N.Y., to a Holtec International subsidiary for decommissioning. CDI, the joint venture, may be the best news for SNC Lavalin in some time. The pending purchase of Entergy's Indian Point reactors follows within a year of its agreement to purchase Exelon's Oyster Creek nuclear power plant and Entergy's Pilgrim and Palisades sites (once the reactors are shutdown permanently). Most articles on the sales note CDI intends on decommissioning the sites much quicker than expected, but I thought it worth following up on the size of the decommissioning funds - which are part of the purchase. There are references in many articles to the size of the funds, but I'll use only one source: the U.S. Nuclear Regulatory Commission (NRC) 2017 Fund Status Reports. Keep in mind the funds are as at the end of 2016 and the NRC's cost estimate is in 2016 dollars. Sometimes my time served battling the enormous waste on wind in Ontario comes flooding back - such as this weekend reading an article on the promise of renewables in Canada's most tell-you-what-to-think publication It's paywalled, boring and one-sided so I'm not going to link to it, but it did incent me to pull some figures, from the Canadian Wind Industry Association. 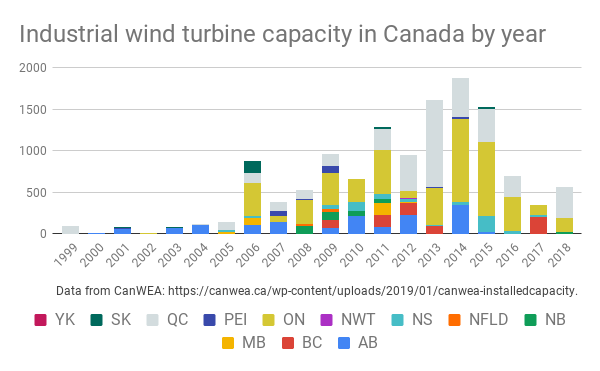 I tried to colour Quebec and Ontario as silver and gold in graphing the increase in annual installed capacity through 2014, and subsequent decline, for reasons I hope become clear during a short review of the current situation for industrial wind in provinces across the country. Articles from this past week on California's utilities include one on utilities seeking rate hikes with rather large Return-on-Equity (ROE) figures, one on a bond agency downgrading the same utilities, and another on the rookie governor's effort to address the issues driving these actions. ...Southern California Edison (SCE) on Thursday asked the Federal Energy Regulatory Commission to significantly raise its return on equity (ROE) due to "dramatic, material changes" to its regulatory and financial conditions. "We do not believe a higher return on equity is a long-term solution to the urgent situation utilities in California are facing," Caroline Choi, senior vice president of corporate affairs for SCE and Edison International, said in a statement. "However, this is what is needed in the near term in order to attract the capital required to provide safe, reliable electricity." The request come following months of warnings from debt rating agencies.